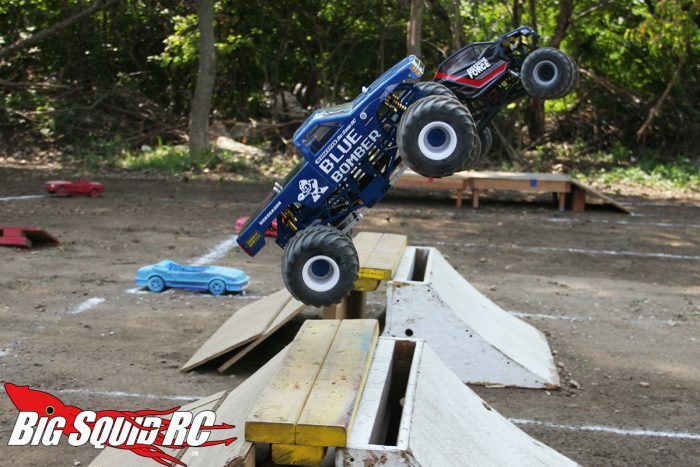 Monster Truck Madness – Upgrading to RC4WD King Limited Edition Shocks « Big Squid RC – RC Car and Truck News, Reviews, Videos, and More! Those of us with large collections of r/c’s all have a favorite rig, right? Mine would be my Blue Bomber. At some point I’ll do a full write-up on this monster, but for now I’ll give you the short of it. It’s a one-off prototype chassis that I rescued from the scrap heap a few years ago. 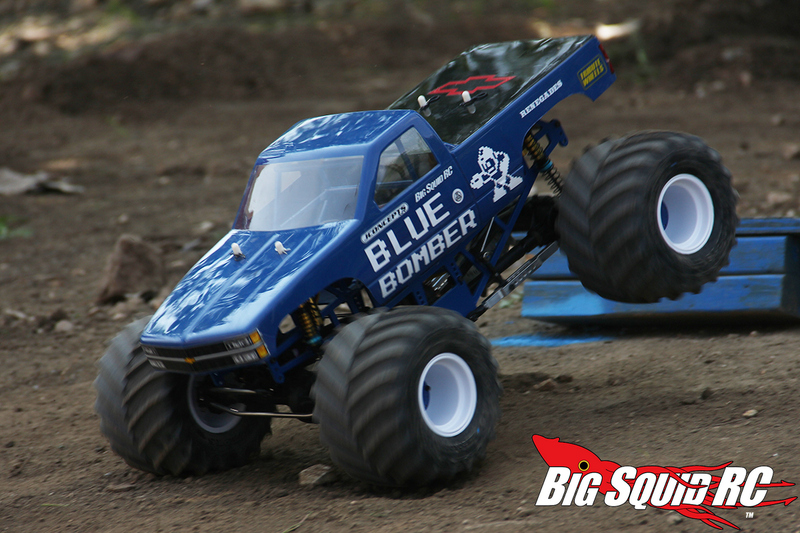 It’s based on a Concussion Motorsports full-sized monster truck chassis and was designed to accept Axial running gear. I sacrificed an RR10 Bomber (this one, in fact) so that this monster could live. This is where the name comes from….well, that and a love for Mega Man. 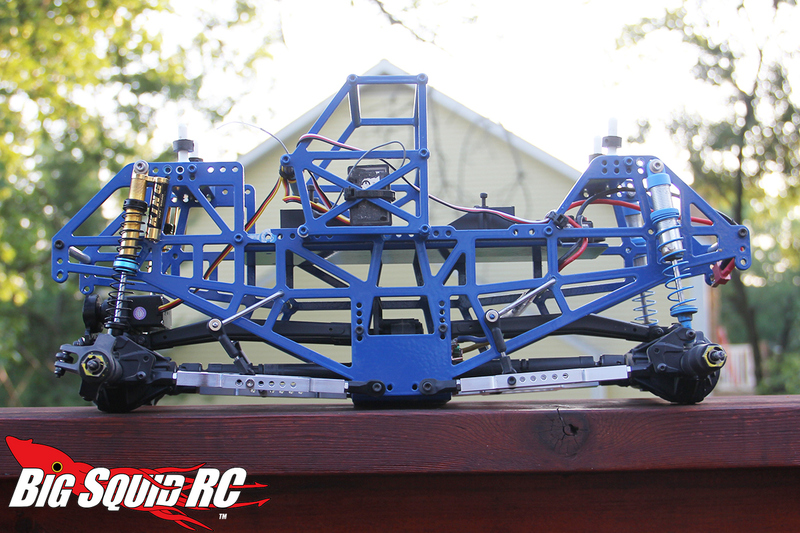 Anyways, it’s a mix of one-off machined stuff, miscellaneous ACRC Clodbuster chassis parts and links, Axial Racing guts and JConcepts wheels, tires and body. Given the nature of it, this truck has taken awhile to “get right”. I’ve been very close in recent months. The final issue I’ve faced was that I wasn’t really a fan of the stock Bomber shocks. I wanted something that was a bit smoother as well as a smidge longer to give me more tuning options. I also wanted shocks that looked a tad more scale appropriate to the real thing. 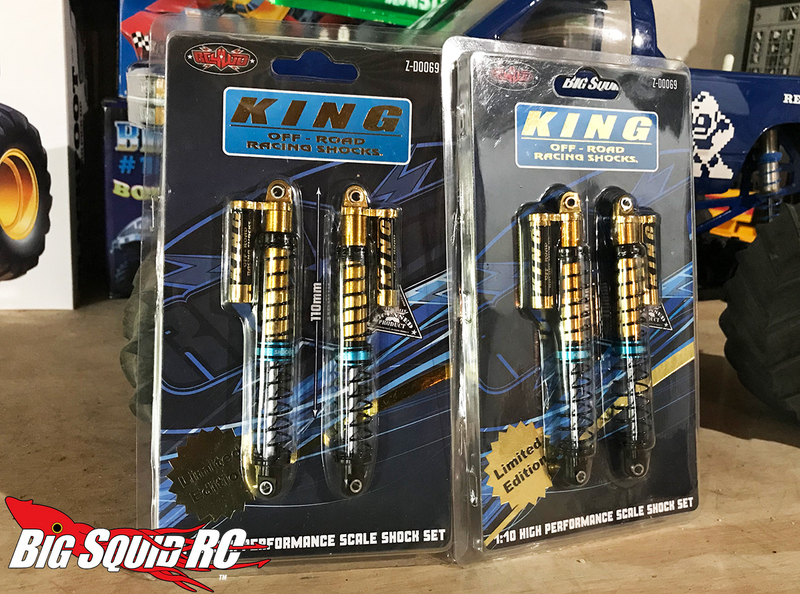 After knowing some racer buddies have had good luck with them, I picked up a set of 110mm RC4WD King Off Road Limited Edition Piggyback Shocks. Now, my friends had the standard blue ones, but with limited gold being available I said “why not?”. The Kings feature a dual spring design and are machined out of aluminum with a faux reservoir. They come completely pre-built, minus oil. I went with 20 wt Associated oil in the front, and 30 wt in the rear. After some quick bleeding to get the oil capacity right, they were ready for mounting. They look REALLY trick mounted up. 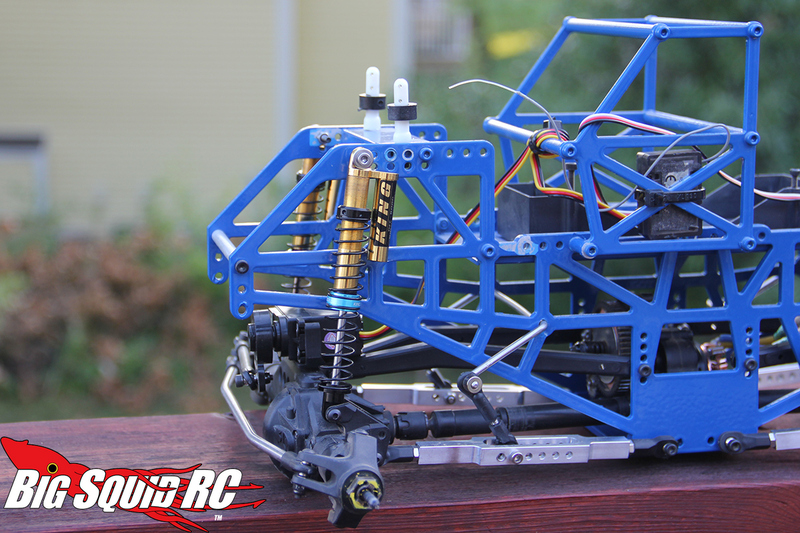 Just for the heck of it, you can see the RC4WD Kings mounted up front, with the “stock” Axial RR10 Bomber shocks on the rear just to see the difference between. You’ll notice I have a pretty aggressive suspension stance, as this truck is specifically a race machine and not a basher. Now, be that as it may, this thing gets a lot of airtime on any given race day. The first time out on these Kings was no different, as seen here. They felt great right from the get-go. The only thing I had to do was add a hair of pre-load to the front and good bit in the rear and then they felt about perfect. The shocks felt planted in the corners but smooth on landing. While I don’t have a ton of time on them to judge durability fairly, I can say that the aluminum construction (caps and all) feels VERY sturdy. Oh, and yeah, they look the part as well. The reservoirs, while fake, look fantastic. The overall slimmer dimensions of the shock also give it that more scale appropriate look that I’m after. 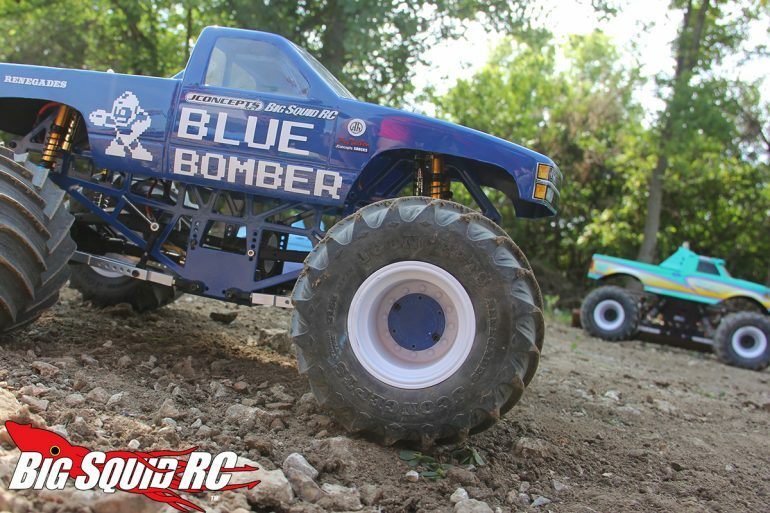 Whenever I do my full-on Blue Bomber build article I’ll make sure and update how I feel about the RC4WD Kings, but I’m loving them for now! Until next time, keep it on all 4’s.